On Friday 25th January Alanna Homes were delighted to welcome back Carlow IT to site, this time with a visit from the 2nd year Quantity Surveying students. 17 students along with 2 lecturers were given a presentation by our own Quantity Surveyor Andrew Champ on Alanna Homes. He also detailed the use of our ROSS-B systems for both precast concrete and Insulated Concrete Formwork (ICF) building systems which are in use across all Alanna Homes developments. 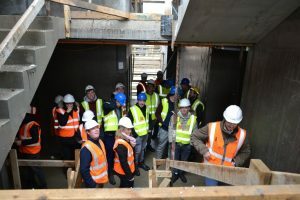 To experience the precast erection in operation along with other activities such as screeding and partitioning, the group was given a site walk around of Phase 1 of our development in Hansfield Station Quarter, Dublin 15, a block of 95 apartment. The group, including the lecturers, were astonished at the quality of the finish, the speed, and sequencing of construction and the implementation of the economic design in our ROSS-B systems. 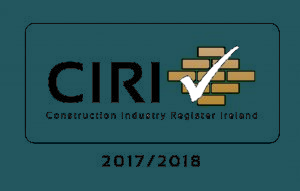 We look forward to future site visits from Carlow IT’s Build Environment Department.